During a meeting with major international organizations on Nov 6, Premier Li Keqiang called for more efforts to safeguard the multilateral trading system and strengthen coordination of macroeconomic policies to support the recovery of the global economy and maintain financial stability. During the “1+6” Roundtable dialogue in Beijing, Premier Li met with World Bank Group President Jim Yong Kim, International Monetary Fund Managing Director Christine Lagarde, World Trade Organization Director-General Roberto Azevedo, Organization for Economic Cooperation and Development Secretary-General Angel Gurria, Financial Stability Board Chairman Mark Carney, and International Labor Organization Deputy Director-General for Policy Deborah Greenfield. The global economy is recovering from the 2008 financial crisis but faces risks and challenges amid globalization and turbulent financial markets, Premier Li said during the roundtable dialogue. China is willing to work with other countries to defend free trade, deepen structural reforms and inject vitality into the market, he said. China’s door will open even wider than it has been over the past 40 years, the Premier said. He elaborated on the Chinese economy, which he said is stable even though it is facing downward pressure. With good economic fundamentals, China is confident in keeping growth at a reasonable rate and boosting high-quality development, Premier Li said. He said China will further lower the threshold of market access and import more high-quality goods and services. China has attached great importance to intellectual property rights protection and will further align with international rules to build a world-class business environment that treats all companies equally, he added. China will further improve its business environment by cutting taxes and fees and streamlining administrative approvals, Premier Li said, adding that the negative list of market access will be fully carried out to cultivate a fair and transparent environment for all businesses. In the Doing Business 2018 report, released by the World Bank, China jumped 32 places from last year. When meeting with reporters, Gurria called on all countries to defend multilateralism, which is a preferable way to resolve issues such as trade tensions and climate change. Over the past four decades, China has not stopped its reform and opening-up, he said. Lagarde said China continues to perform well in terms of economic growth this year even though the global economy faces challenges such as trade tensions and the vulnerability of some emerging economies. 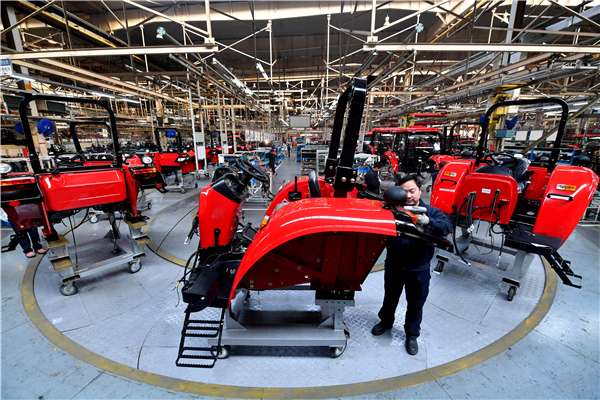 China should keep opening up, continue with structural rebalancing and make private, State-owned and foreign companies on a level playing field in order to shift from high-speed growth to high-quality development. In a separate meeting with Lagarde on Nov 6, Premier Li said China will further open up its financial sector in an orderly and independent way, especially in banking, securities, funds and futures, while maintaining financial stability. China is willing to maintain closer exchanges with key international organizations, including the IMF, to promote global economic cooperation and free trade, and also inject momentum into the global economy and financial stability, Premier Li said.